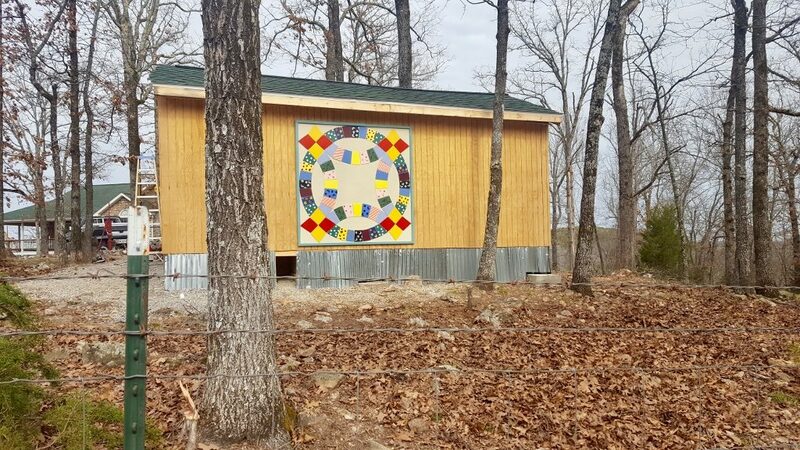 #5-3, “Pig Tails” painted by Glenn and Sandy Priebe and located at their home at 4061 Old Military Road, Mountain Home Arkansas. 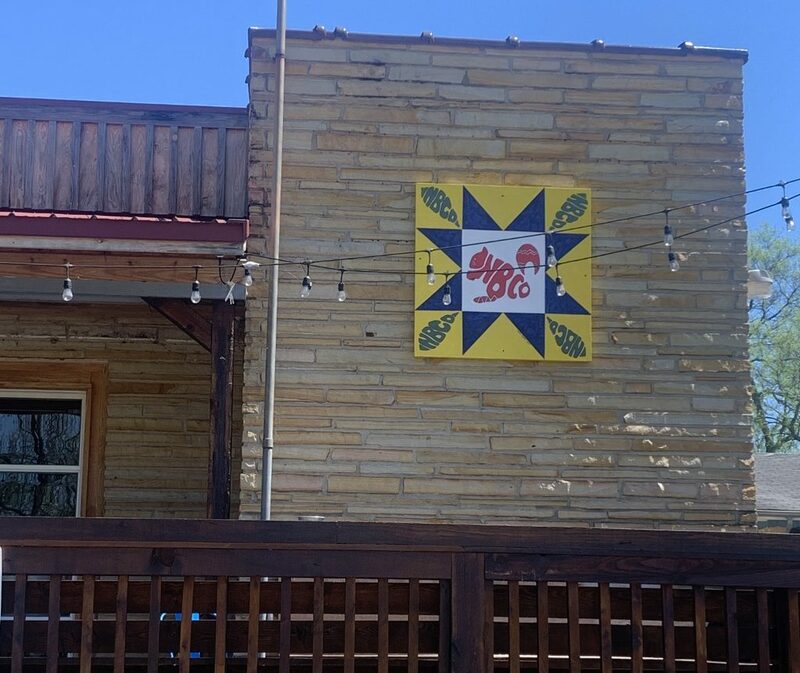 #4 The Mexican Star is one of several quilt blocks commemorating the Mexican War of 1846-1847 in which the United States acquired lands that would eventually become Arizona, California, New Mexico, Nevada, Utah, southwestern Colorado, and southwestern Wyoming. #5 The Charm Block consists of four half-square triangle blocks in the center with three half-square triangle blocks in each corner. The making of charm quilts, in which no two pieces are cut from the same fabric (our modern day “scrap” quilt), was popular around the turn of the century. A legend associated with the charm quilt says a quilt should contain exactly 1,000 different fabrics! When a maiden had collected exactly 999, the man she was to marry would appear, bearing the 1,000th fabric! The Baxter County Fairgrounds was purchased in the 1950’s and the county fair has been held at this site every fall since that time. This quilt block was painted to honor all the Baxter County residents who attend and volunteer at the fair. It also honors Fair Board members who work year-round to make the Baxter County Fair one of the top county fairs in Arkansas. This quilt pattern features the Ferris wheel from Neverland and all the fun that everyone has at the fair and also includes food booths that are a staple of the fair. 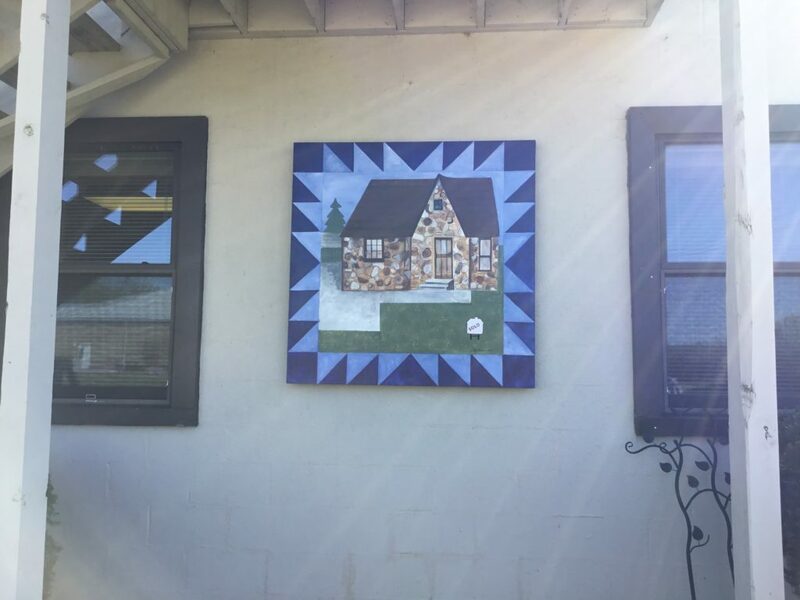 The Fair-Is-Swell quilt block was painted by Margaret Stafford with the assistance of her husband Darrell, who has been a Fair Board member for 11 years. If you look closely at the children on the Ferris wheel, you will see Raquel (the Stafford’s granddaughter) holding up her arms as she rides while having fun at the Baxter County Fair! #5-8 “Four Flying Fish” quilt block is located at 2224 County Road 10, Midway AR. 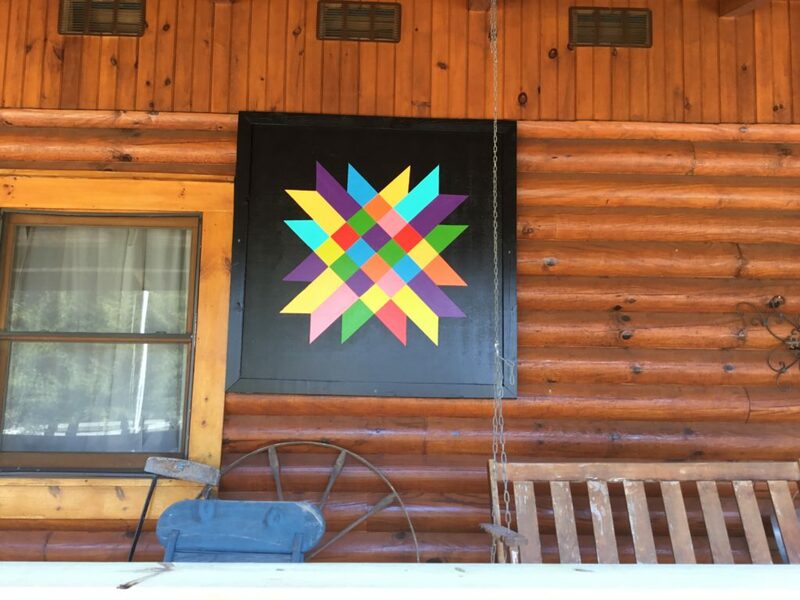 Designed and painted in the colors of a rainbow trout by Cindy Johnson, the 4×4 pattern was chosen to honor her quilt-making grandmothers and the two previous residents of this property. Originally a wooded stretch on upper Bruce Creek, it was developed in the 1990’s as a catfish farm that supplied area restaurants. In the early 2000’s, renowned fly-fishermen Dave and Emily Whitlock stocked the pond with trout and ran a fly-fishing school here. Concrete raceways for fish hatchery are still in the floor of the barn, a wide variety of fish live in the pond, and an avid quilter lives in the house. 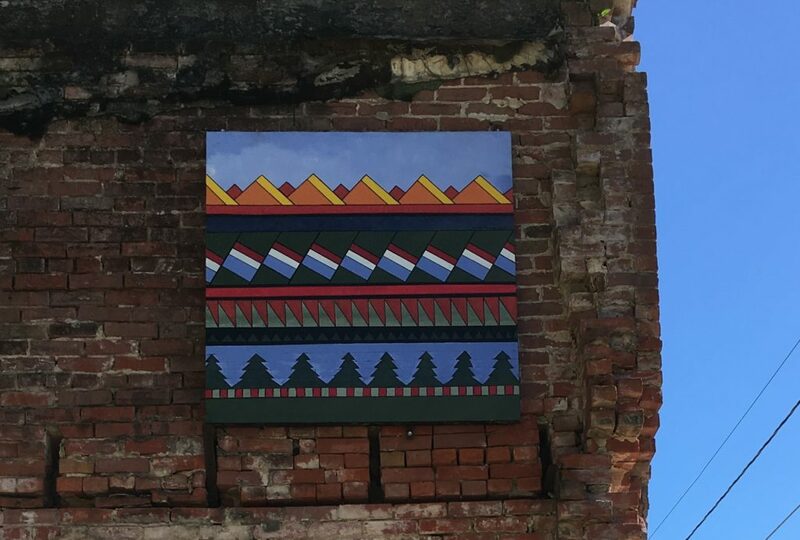 #5-13, Seminole Patchwork, is a 4×4 quilt block painted by artist Linda Havner and is found hanging on Norfork Adventure Supply which is owned by Jake Anderson in historic downtown Norfork. 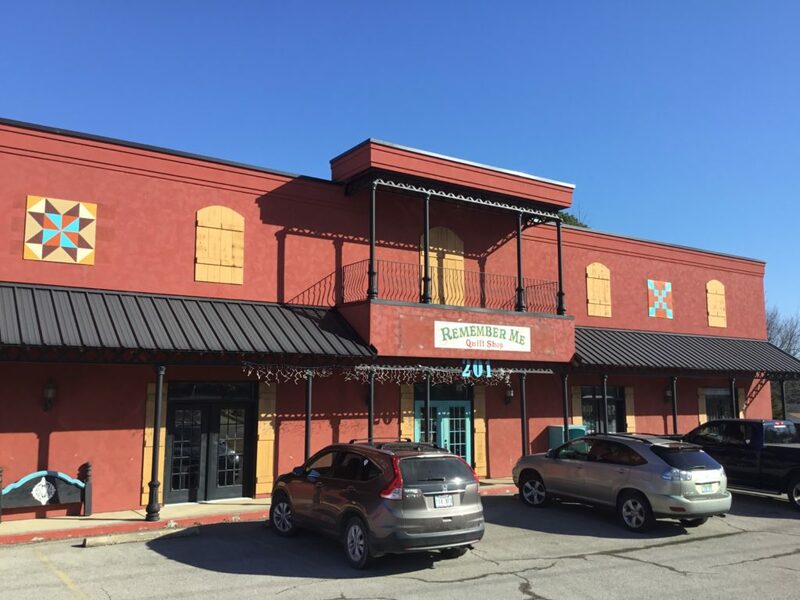 The building housing the business was built in the early 1900’s and at one time was a grocery store with living quarters upstairs. Jake is a trail advocate and steward promoting a healthy, active lifestyle. He has an exercise physiology background and specializes in helping individuals connect with nature via rivers, lakes, nature trails, hiking, biking, and paddling. Jake says the Seminole Patchwork block represents the rivers, trees, and trails of Arkansas. 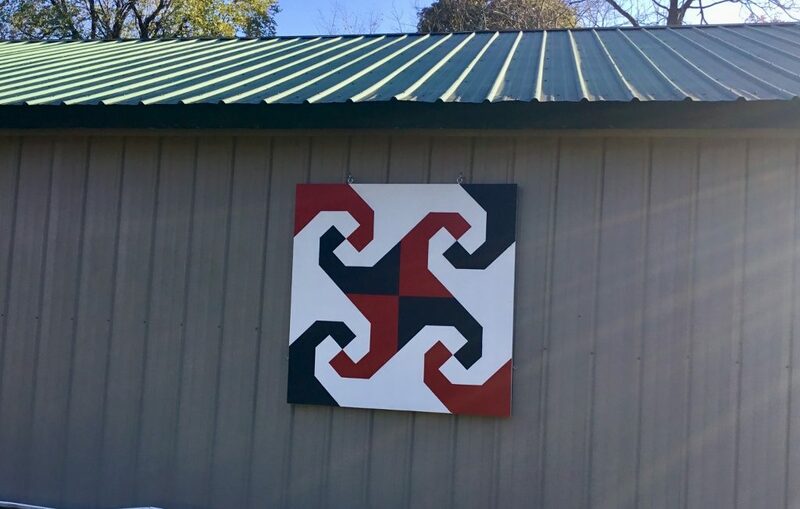 #5-14, Crowns and Cross, was painted by Mark and JoLynn Farruggia and is hung on their property at 120 Hwy 178 W, Midway AR. 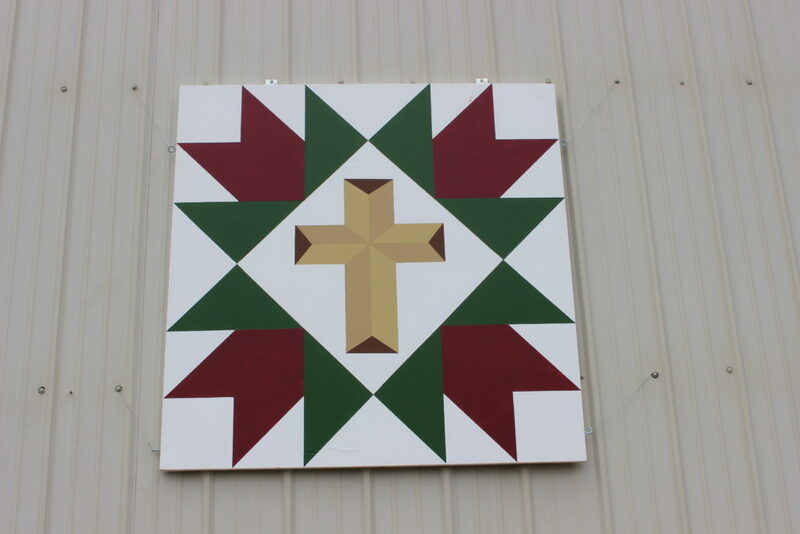 JoLynn shared this about the colors and design of this special block: “We chose this pattern, Crowns and Cross, because it is an old pattern for quilting, but also for the ease of showing the unity of our nationalities and families. It shows regal with the Crowns and faith with the Cross. I am of Irish and German descent, Mark is of Italian/Sicilian decent. We used green, white, and orange for the Irish flag; the black, red, and gold for the German flag. 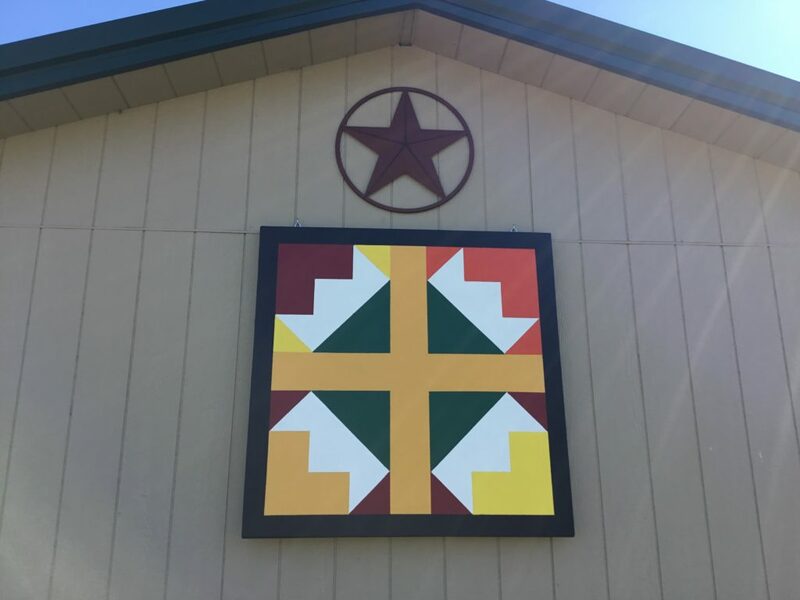 We took again green, white, and red from the Italian flag and the red and yellow from the Sicilian flag to create the colors for the block which truly made this “our quilt pattern”. 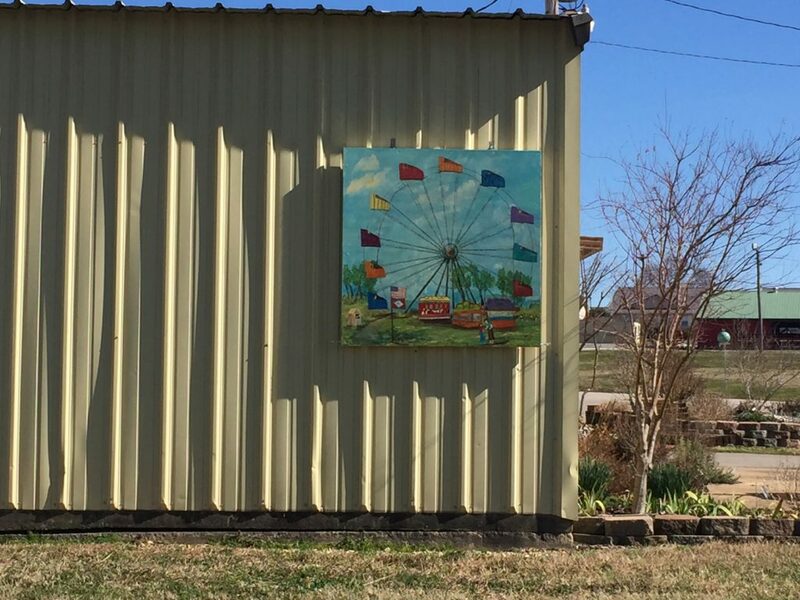 #5-15, “The House That Bluthe Built” is at 1357 Hwy 62 SW, Mountain Home AR and was painted by Linda Havner. Joan Gilbert, owner of Gilbert Realty, shared, “We started our business in 1969 on Hwy 5 North, here in Mountain Home. Later in the 70’s, we were wanting to relocate and bought a 30 x 30 charming stone building at this current location. It had an unfinished basement and an attic area with the traditional cedar planking on its walls and ceiling. We then began to remodel the residential home into our office when we were visited by a neighbor, Mr. Nelson, for whom Nelson Street is named. He had lived in the area for many years and told us that our great uncle, Bluthe Gilbert, had actually built the home back in the 1940’s! It was a very pleasant surprise, and encouraged us to try to keep the same gable and stone theme on our addition. 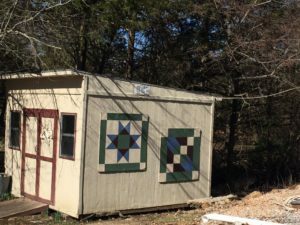 #5-16, Paw Paw Star is at 13980 Hwy 5 South in Norfork, AR. Jason Aamodt, owner of The Norfork Brewing Co., said they moved here because of the good water and clean atmosphere. The blue star on the quilt block stands for the water and mountains, the squirrel for nature, the PawPaw leaves for their new trademark beer flavor, and the yellow for sunshine. 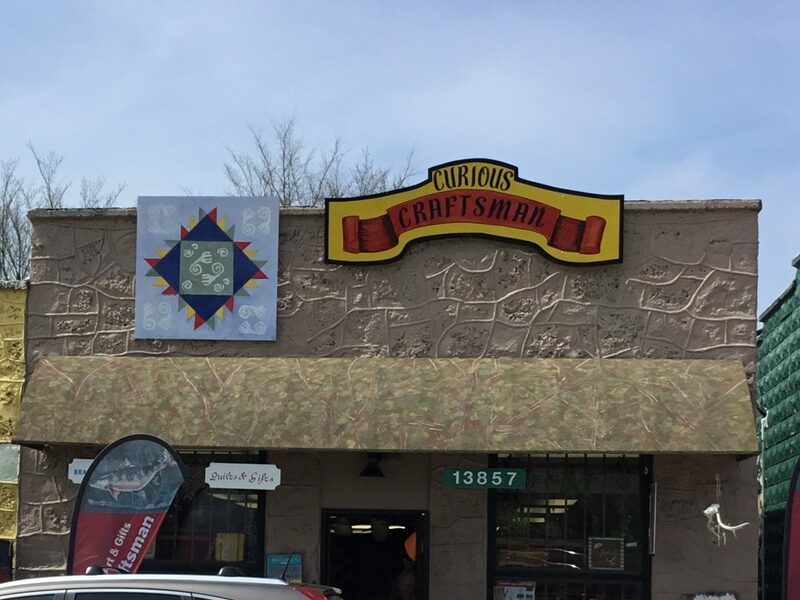 This unique quilt block hangs on the newly remodeled old Benbrook’s grocery and post office. 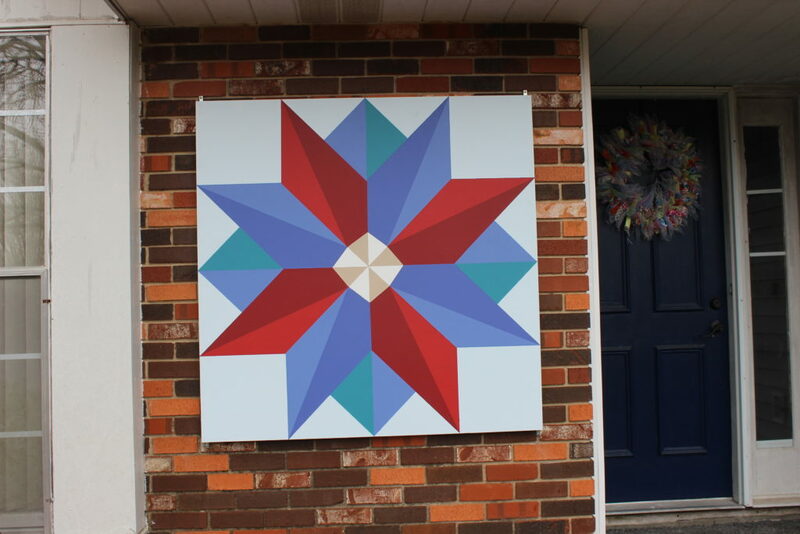 The 4×4 block, a traditional Star with appliqué motifs was painted by local artist Linda Havner. If you are in the area on a Friday evening, a Saturday or Sunday afternoon/evening, Jason invites you to stop by for a beer, tasty food from a food truck, and wonderful live music from local musicians, a great time to relax and enjoy the beauty of the area. Glad to hear of your interest, Dianna! What county do you live in? Thanks, Shirley. 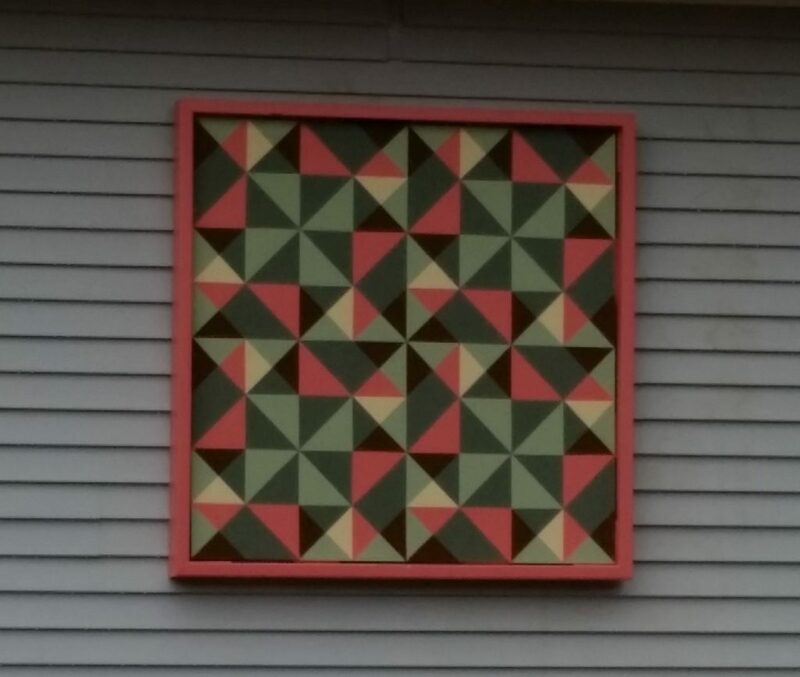 Glad you are enjoying the Baxter County Quilt Trail.